We begin the fourth "chapter" in our travel blog on our extended trips around the world. This time Southeast Asia, including Laos, Cambodia, Thailand and Singapore. The first was "Where's the Beef? 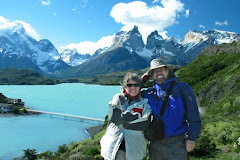 --Argentina", the second was "Belize Time". The third "chapter" was our 7-month round-the-world trip to Asia, India and Europe. Please visit our "Links to Hotels and Sponsors" to give them some support. 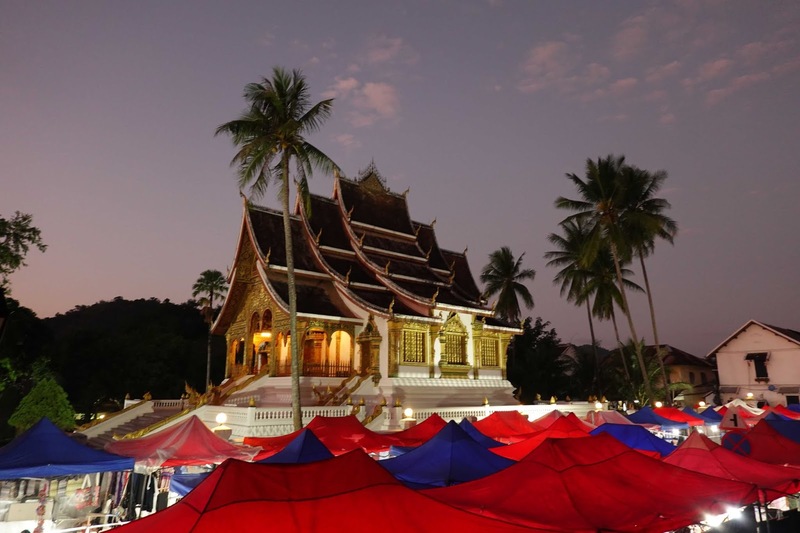 Luang Prabang is well known for its extensive night market, with stalls selling everything from bamboo straws to handmade Laotian blue indigo scarves. The main street shuts down at 5 pm for several blocks, the tuk tuks and motorcycles disappear and very quickly bright red canopies are thrown up to completely fill in the roadway. 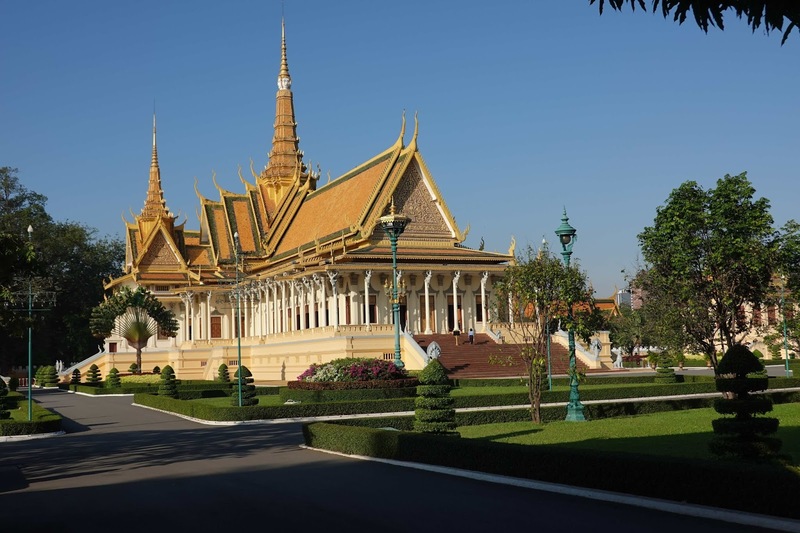 It’s actually quite pretty, especially with the gold temple at the former royal palace in the background. 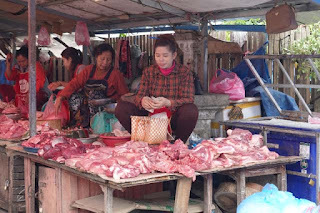 Lesser known is the day market where locals go to buy food for their daily needs. 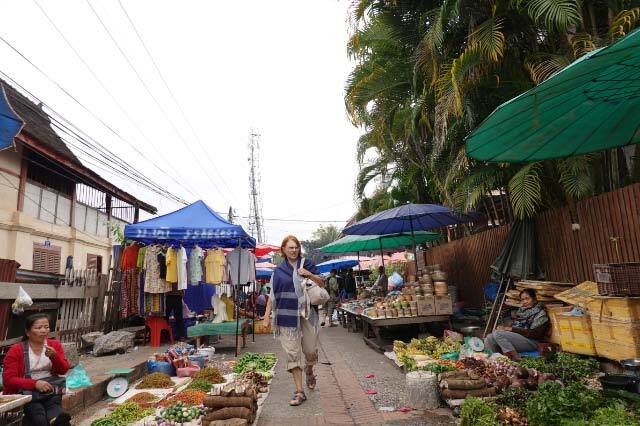 Unlike the Night Market, which is really for tourists, this market really does cater more to the community and the average Laotian consumer. 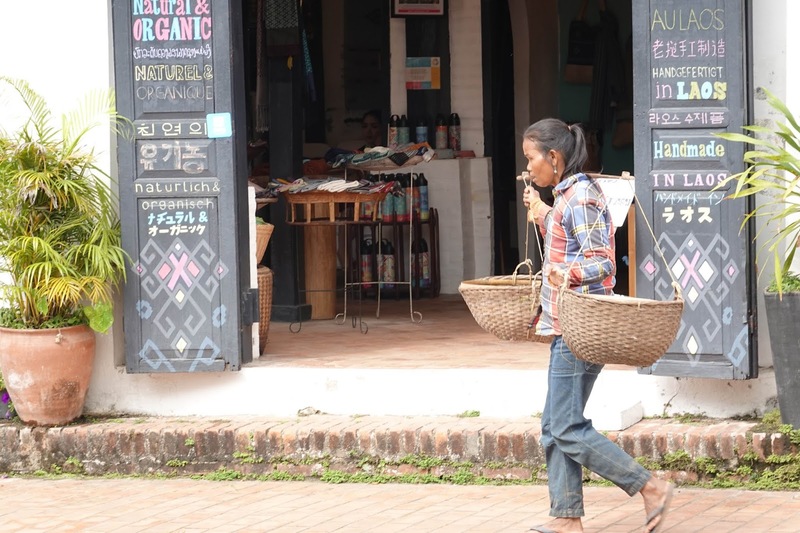 Many of the vendors come from the surrounding countryside very early in the morning to sell their fresh goods. The market is open from 5 to 11 a.m.
No grocery stores here, no vegetables in tightly sealed plastic clamshells and no lineups at the cashier. They don’t exist. Life here isn't sanitized and aseptic. This is life in Asia in all it’s gritty, fascinating and sometimes shocking raw glory. 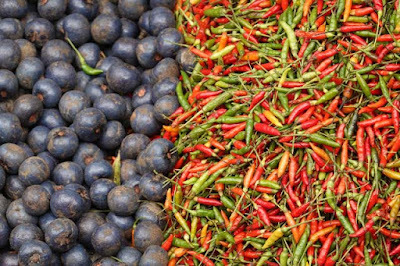 What you'll find is everything from colourful bougainvillea flower petals and spices to fresh caught fish and BBQ’d bamboo rat (yes, its a thing). You'll find items that you didn't know you could eat and some things that you'll really want to try for breakfast. It's also a great place to photographer the vibrant colours of Laos. 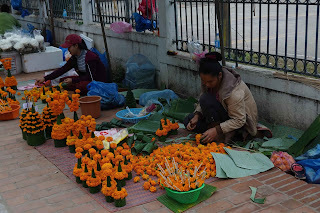 Take a stroll with me and Carolann through Luang Prabang’s day market. 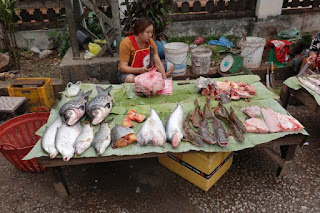 The market is definitely a must see when you're in Luang Prabang. The day market is on a side street that runs parallel to the main street that hosts the night market and is just up from the Mekong River. It's right in the heart of Luang Prabang and is close to many of the hotels. 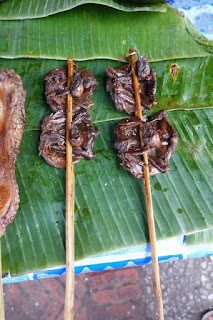 Frog legs appeared on quite a few menus in Luang Prabang and we often saw them on the roads at night. 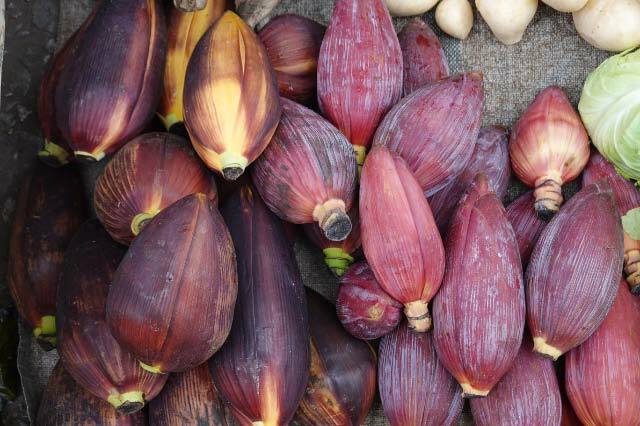 We didn't try them and I think the way they were sold live in the market was very inhumane. You could find pretty much everything in the Day Market, including grilled Bamboo rat and bats. But why anyone would want to eat a bat is beyond me--it's all skin and bone! 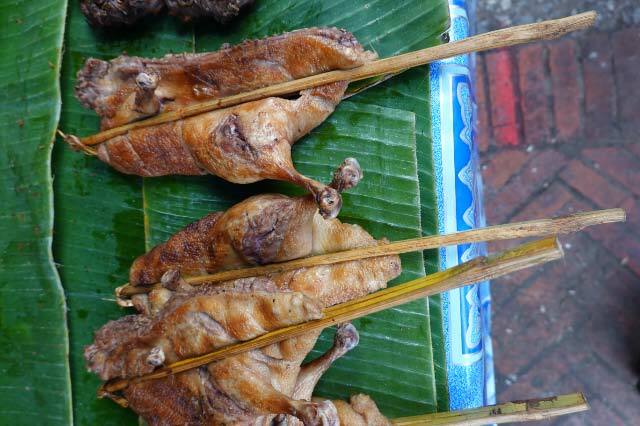 Bamboo rats are nocturnal, slow moving rodents that live in burrows and feed on bamboo underground. 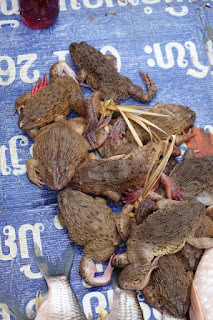 They weigh about one to two pounds and reminded me of the South American Cuy or Guinea Pig. Flying into Luang Prabang, Laos, we drop from the clouds to skim through the mountain crags, gliding along the winding Mekong River to the tiny airstrip. 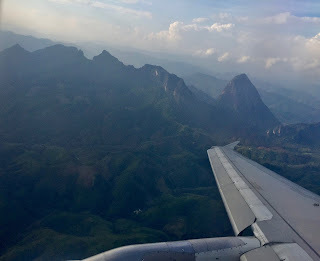 The jungle clad mountains fold into the distance like one of those misty Chinese paintings. A blast of hot, humid air hits us as they open the airplane door. 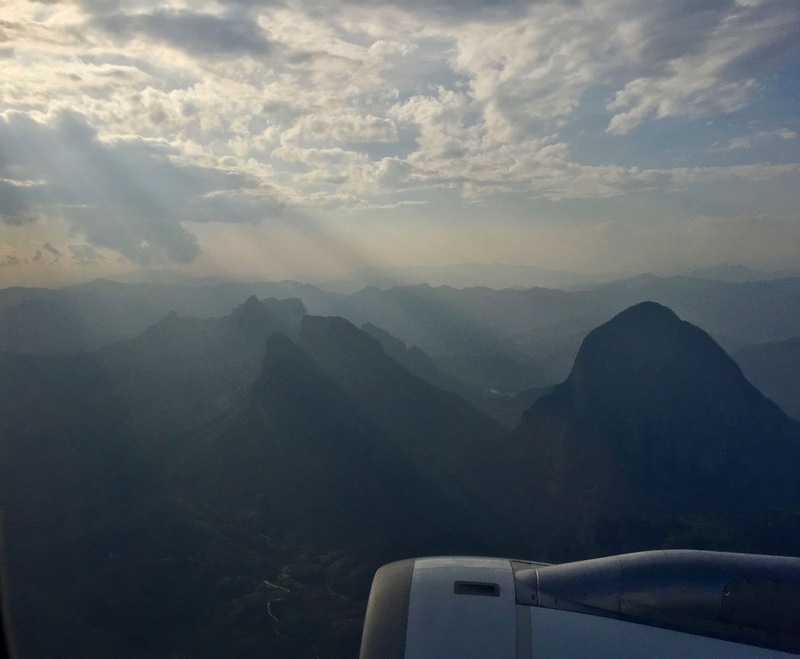 We have arrived in Laos, our first time in this historic country, the mysterious land of saffron-robed Buddhist monks and golden temples. 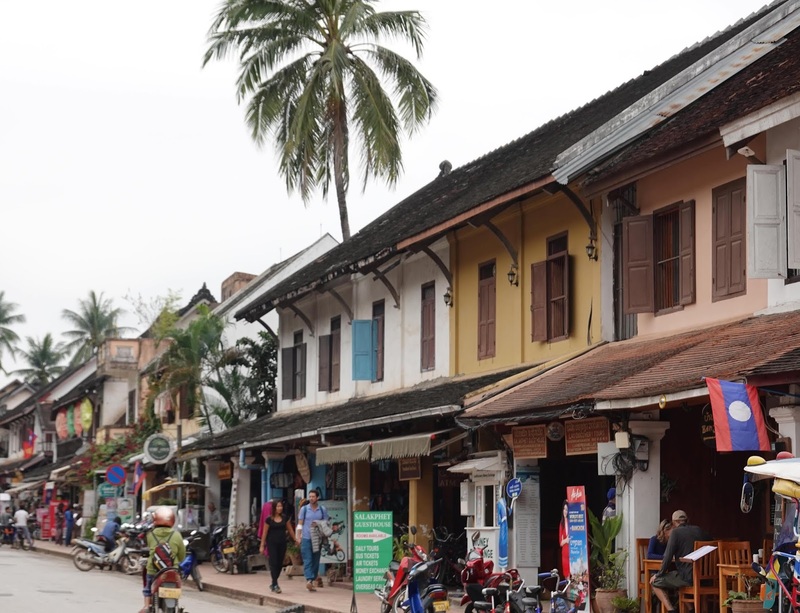 Luang Prabang is the former royal capital of the Kingdom of Laos and is now a World Heritage Site known for its well-preserved French colonial architecture, its ancient temples and monasteries. 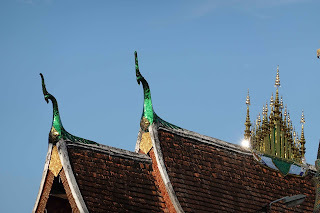 There must be more temples here per capita than anywhere else in the world! 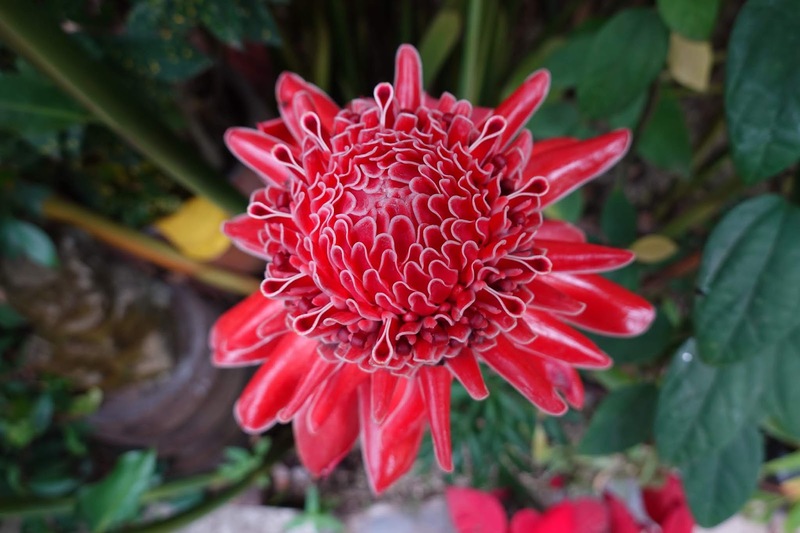 The streets of Luang Prabang are not just full of French Colonial architecture and Buddhist temples, but all kinds of interesting art, people and incredible tropical flowers. They also make great croissants and these wonderful, hot, gooey coconut pancakes sold on the street and served in a folded banana leaf. It’s our new favourite snack after a long day walking through town visiting temples. Our third day in Laos, we discover by accident an amazing restaurant hidden on a dark side street. 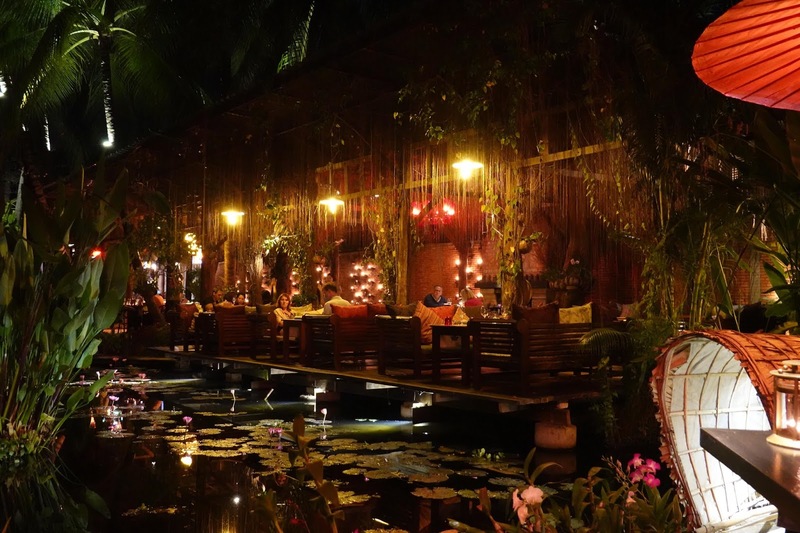 It's an outdoor gem called the Manda de Laos and it is a magical place with lotus ponds, candles and palm trees. The day started overcast with a cool mist, followed by a hot sunny afternoon and now, in the evening, it has cooled down again. So the frogs in the Manda de Laos lotus ponds must think it’s spring for they are singing their love songs with abandon. It starts with the loudest, biggest frog and then hundreds of croakers and peepers join in, building to a crescendo of delight. Then just as suddenly it ends. It’s a wonderful romantic concert on a warm night in Luang Prabang. If you’ve read the book First they Killed My Father or seen the film of the book directed by Angelina Jolie, you’ll understand my reluctance and actual fear to visit the Killing Fields outside of Phnom Penh and the Genocide Museum in town. The book recounts the horror and atrocities of the brutal Khmer Rouge regime under the madman Pol Pot during the nightmare period from 1975 to 1978. I won’t go into a lot of the history that led to the genocide, if interested you should read the book, but basically American bombing of Cambodia during the Vietnam war forced thousands of Cambodians to flee the countryside for the safety of Phnom Penh. Cambodia was the most bombed country not just during the war, but in history. 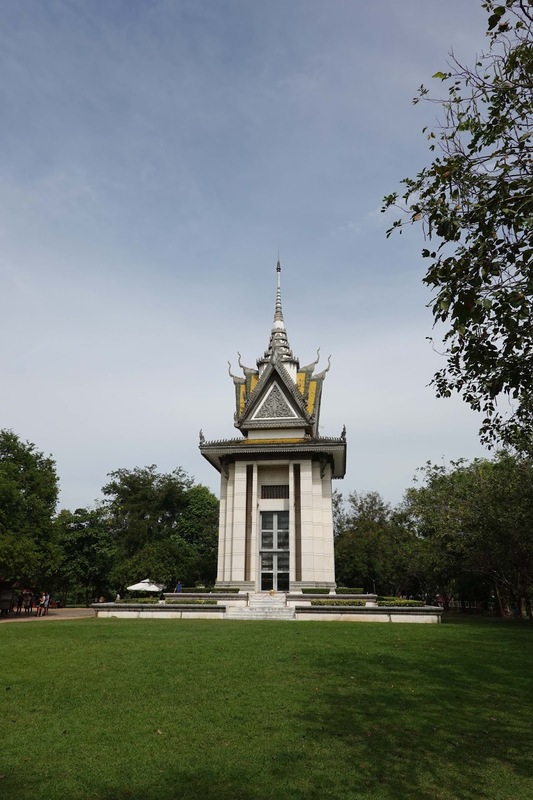 The bombings, starvation and hardships made life in the countryside unbearable and people without hope welcomed the change they thought the Khmer Rouge would bring. Over a million desperate people fled to Phnom Penh swelling the population to three million. They actually cheered the soldiers as the Khmer Rouge took over the city. 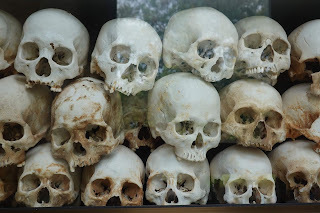 Sadly, the madman Pol Pot backed by communist Russia and China launched a massive genocide in the name of social revolution—a failed experiment inspired by Mao’s communist regime in China. 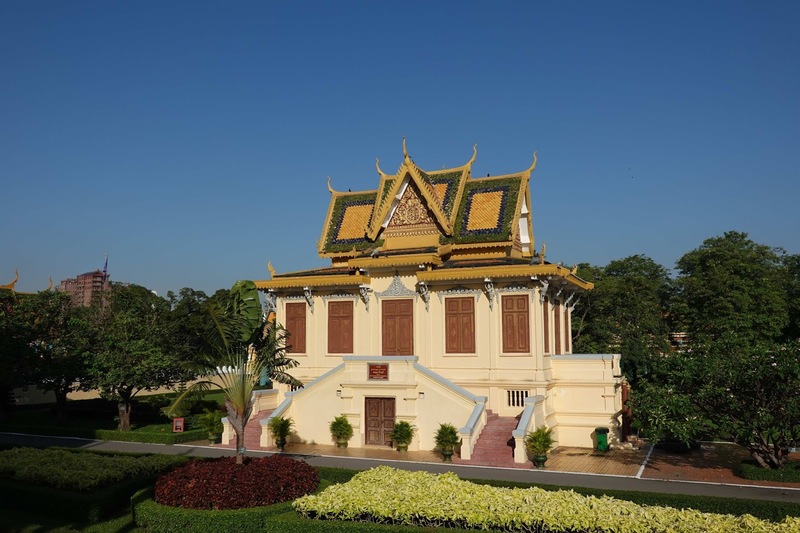 Almost the entire population of Phnom Penh was forced out of the city as part of Pol Pot’s utopian agrarian vision. A third of the entire Cambodian population was murdered, starved to death or died from illness or disease—three million people out of a population of roughly 10 million! Innocent people were imprisoned merely because they wore glasses, had soft hands or an education. City dwellers were forced into slave labour camps or into fields to grow rice, a skill they did not have. If they didn’t meet their quota, they were killed. Steal a grain of rice because you and your children were starving and you were killed. But it wasn’t just the genocide of his own people that is so shocking and horrific, it is the brutal way men, women and children were tortured and slaughtered. The details are chilling. Horror stories from the few survivors are the chimera of nightmares. 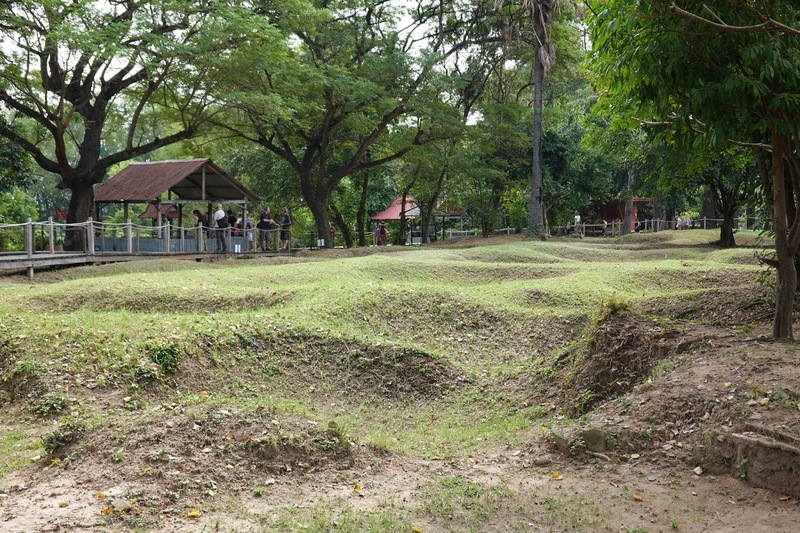 Hence my trepidation to visit the Killing Fields and the shocking prison, now the Genocide Museum, where the atrocities were carried out. If you left the prison, it meant you were shipped off to the killing fields and crudely dispatched with farm tools in order to save bullets. Death was not swift or painless. Thrown into mass graves the bodies were covered with DDT to mask the smell, sometimes while the victims were still alive. I took very few photographs because of my shock. But my photos could not possibly convey the horror, the gut-wrenching chill, the deep sadness one feels when you see the pits of mass graves, now shallow depressions in the grassy field. 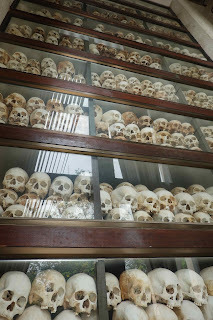 Worse still is the display of skulls arrayed in a memorial tower 17 rows high. Bone fragments and teeth regularly wash up to the surface of the field after a rain and are collected by staff. 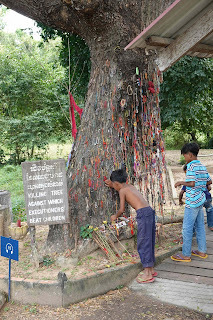 And then there is the tree where babies were bashed to their death. If you now find it hard to breathe, you can’t swallow, or a tear comes to your eye, I will have succeeded in conveying a small fraction of the deep sadness, horror and depression I felt. I want this to be as difficult for you to read as it was for me to witness. A stillness comes over the two sites as people follow the guided trail in stunned silence. No one speaks as we shuffle along the path listening to the horrible details and tales of the few survivors, of the child soldiers who were forced to murder or be murdered, of the farmers who discovered the pits when they went searching for food after the fall of the regime. Sadly this killing field was just one of many. 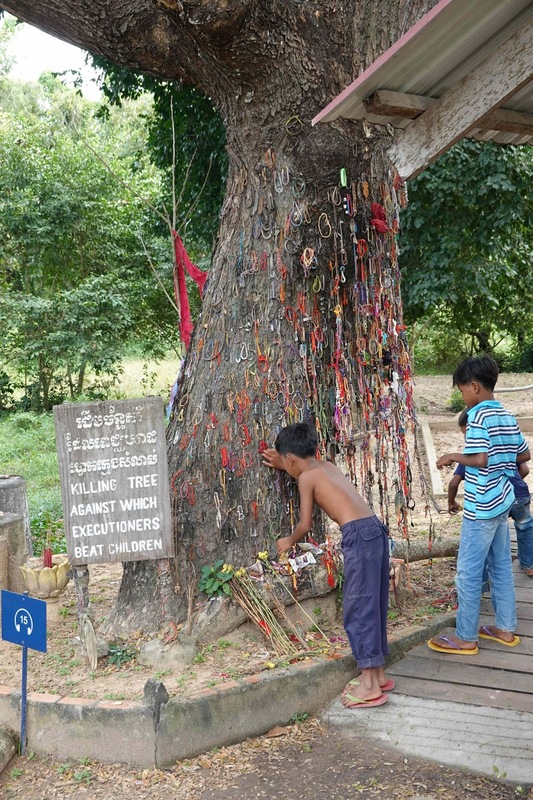 In a sad juxtaposition of history and memory loss, these children were playing with memorial ribbons left on the "Killing Tree" against which soldiers bashed the heads of babies before throwing them into the mass graves. 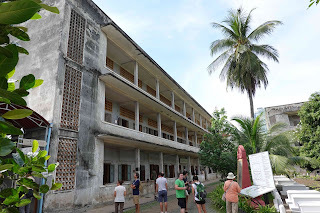 At the prison in Phnom Penh (one of hundreds around the country), where only 12 survived of the thousands tortured there, you tour the small torture rooms of what was once a high school, now a testament to incredible suffering. Iron shackles on beds held the victims in place and blood stains on the floor testify to their suffering and their brutal murders. Fourteen grave markers indicate where the last victims to die at the prison are remembered. They were left to bleed out when their torturers fled the invading Vietnamese “liberation” army. The audio tour relates the horror of daily beatings, torture and horrible murders of the victims. 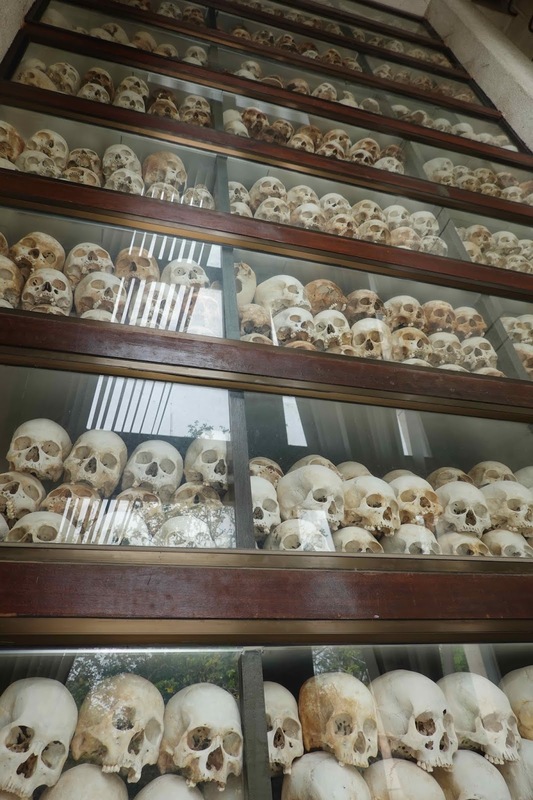 Like many depraved regimes, the Khmer Rouge kept detailed records of the victims, their torture and their deaths. The jailers did not have time to destroy all of the records. Photos, paintings and actual torture devices add too much realism to the gruesome accounts. You are in the room with the victims. 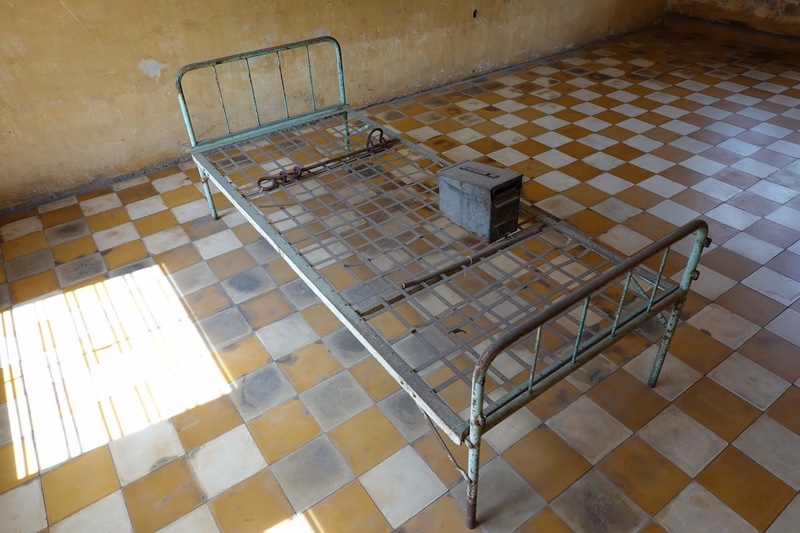 In one room a bare metal bed shows the leg shackles that held the torture victims in place. The rule was do not scream or you will be beaten worse. 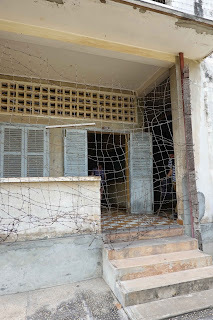 Another building in the prison complex was full of tiny holding pens made of bricks. 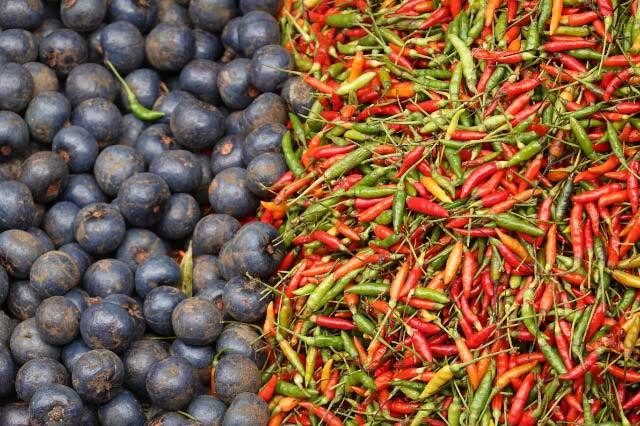 Can you imagine the heat. The exit was covered in barbed wire to prevent escape or suicide even though victims were shackled together at the ankles. Incredibly, two survivors are at the prison to tell their stories through their books. One is a painter who was saved because he could accurately depict the torture and deaths, and the other a skilled labourer who was spared because he could repair the typewriters used to record the sordid details. It is all too depressing and nightmarish for me to recount and give any justice to the victims and the method of their deaths. Yet I felt a moral obligation to visit and to tell my experience out of respect for the victims and in a small hope that somehow sharing their story will help prevent future atrocities. 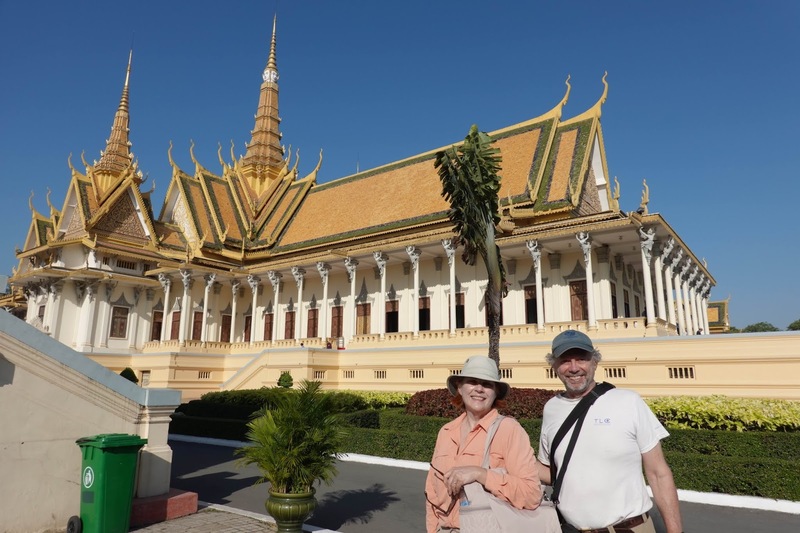 Back in Phnom Penh we finally managed to visit the Royal Palace, home of the current king of Cambodia. 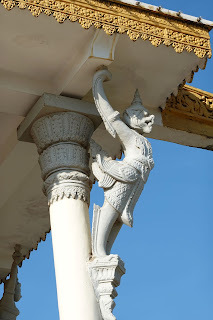 It took us several days to get in to visit because of some unusual practices at the palace. It’s hard to believe they still have royalty after the horrors of Pot Pot. 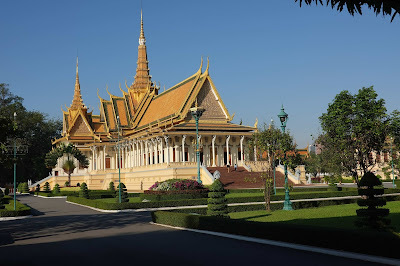 But the king is alive, very much respected and still very active in Cambodian life. 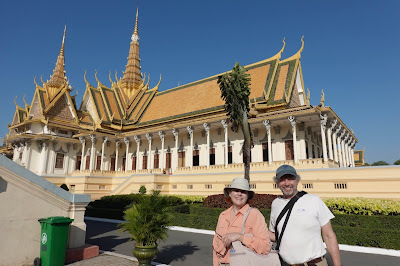 On our first attempt to visit the palace, we learned that they would not take credit cards for the $10 US entrance fee, something that we have not seen in any other Asian country. 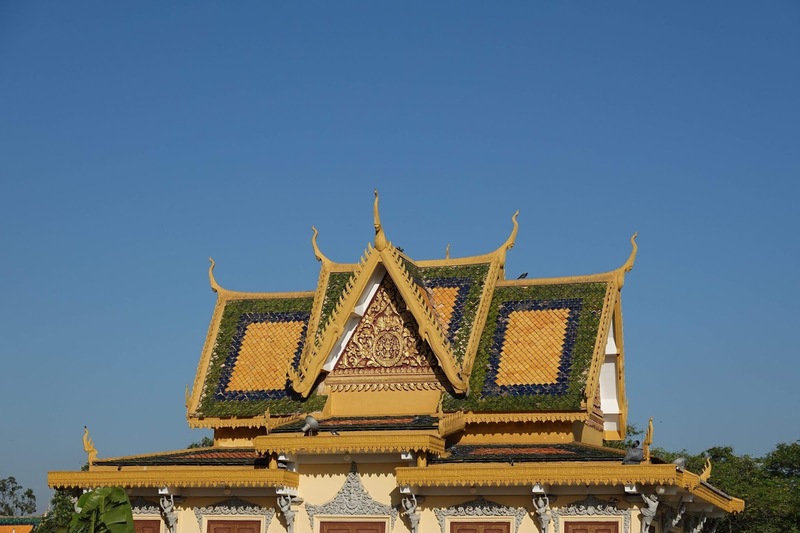 On our second try, the palace was closed due to the bi-monthly practice of the king giving out food to monks and the poor. On our third visit, we were refused entry because Carolann’s shoulders were covered only by a shawl. Based on our experiences in Thailand, Malaysia, Bali and China, Carolann had dressed respectfully with knees and arms covered. But it turned out that a shawl was not allowed. We pointed out several other more scantily clad women with bare arms and legs, but to no avail—the guards would not budge. So again we went back to our hotel, hotter and dissatisfied for a third time. We later learned that, in the past, groups of Chinese tourists had visited with shawls covering their bare shoulders only to remove the shawls once inside. So they banned shawls outright. On the fourth try, Carolann wore a long-sleeved, much warmer shirt! But we were successful! 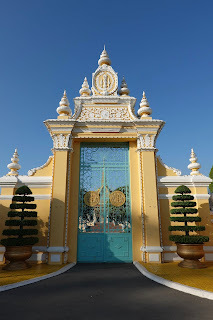 The ornate main gate of the Royal Palace faces east and the Mekong River, which was used in the past by official visitors who arrived by boat. You’ll note that the gate is large enough for elephants to pass through, which is how the king and other dignitaries travelled back then. Apparently, horses weren’t practical because they couldn’t plow fields. In one of the photos below, you might notice a building with high stairs. 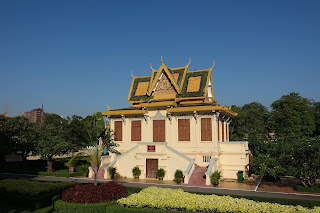 This is the building the king used for climbing onto the elephants. 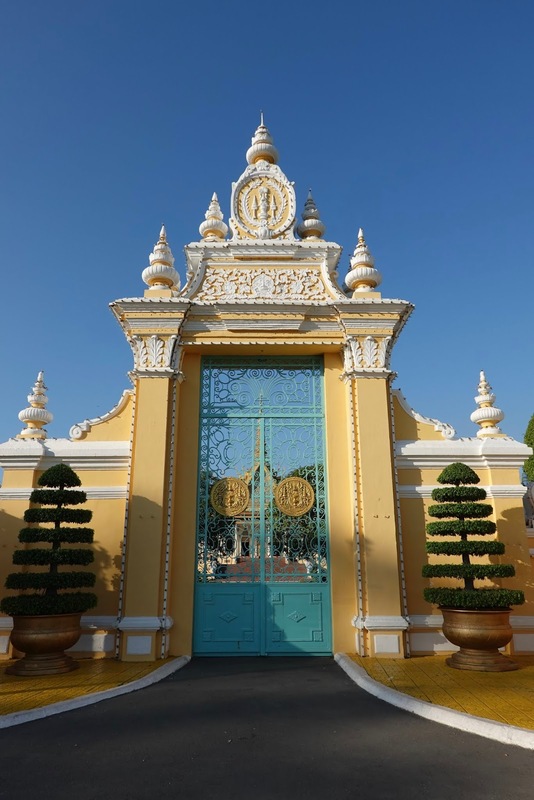 The walled palace grounds contain several large buildings clad in gold and marble and roofed with brilliant green and yellow tiles, which I love. The gardens are in a formal French style. Not surprising since Cambodia signed a treaty of protection with France in 1863 and was basically a French colony until 1953. 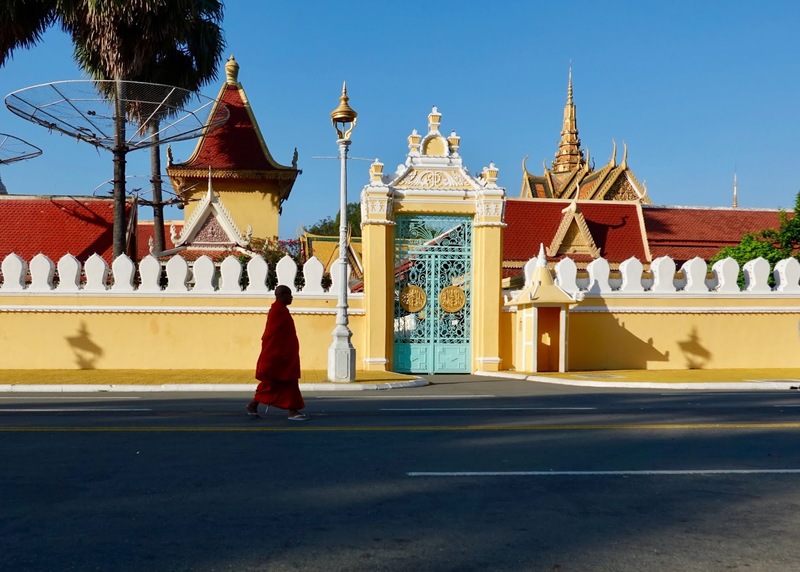 A combination of Hindu and Buddhist beliefs and practices are in evidence at the palace—both religions are celebrated here on different holy days—even though the present king and the country are Buddhist. The structures feature a lot of Hindu iconography and architectural features because the palace was built by a Hindu king in the year 1866. Formal costumes and dress showcased in one building can be modified to suit the religion of the day’s celebration. 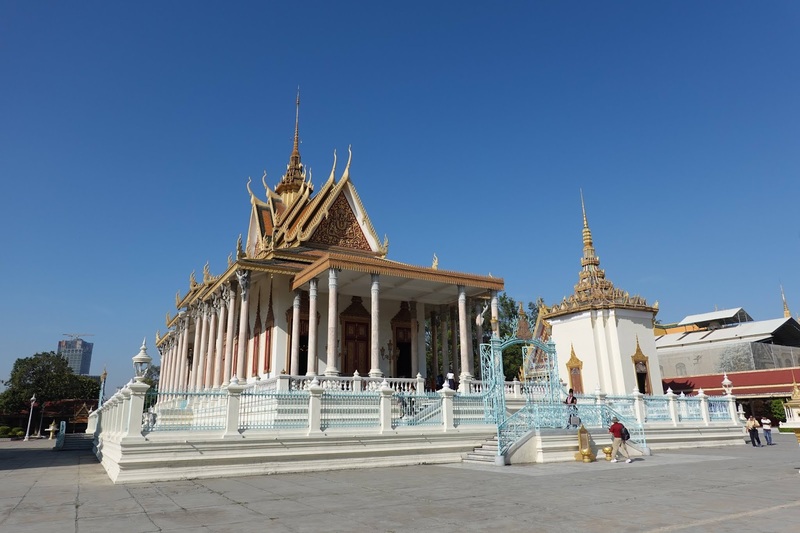 The main Throne Hall is a cross-shaped building crowned with three gold spires and stunning gold figures—guardian angels and Garudas. The central, 59-metre spire is topped with the white, four-faced head of Brahma, the creator god in Hinduism. 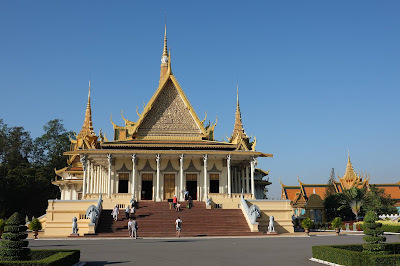 Our guide explained that even today many in Cambodia (mainly uneducated farmers and peasants he said) believe the King is descended from the gods, which is why Brahma is at the top of the Throne Hall. Stylized Garuda figures are prominently featured around the roof of the Throne Hall and are symbolic of the legendary bird god lifting up and protecting the palace. Garuda is an iconic symbol of the king's duty and power, an insignia of royalty. The original wood carved figures have been replaced with ones made of concrete. 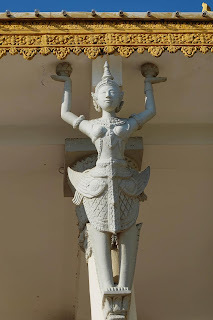 Unlike the Apsara dancers you see at Angkor Wat, the Throne Hall roof is also adorned with angel figures, many covered in gold leaf. I wasn’t allowed to photograph the interior of the large Throne Hall but it had a ceiling covered in a painted version of the Ramayana, a classic Hindu story of war and love. A golden throne sat at one end of the hall with chairs in front and to the side of it for visiting dignitaries. 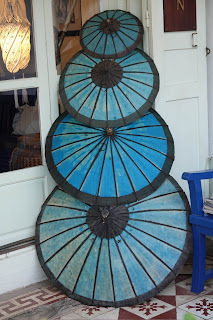 It is still used today when foreign officials and heads of state visit Cambodia. 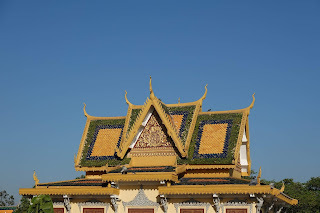 The king resides in another palatial building also adorned with gold at the back of the large compound and when he’s in residence a blue flag is flown. It was flying when we visited but we didn’t see him and he didn’t offer us any food. 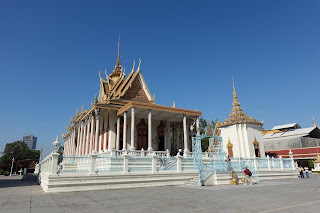 The other main building on the site is the Silver Pagoda, which I expected to be clad in silver, not gold. But it is actually famous for its silver floor. 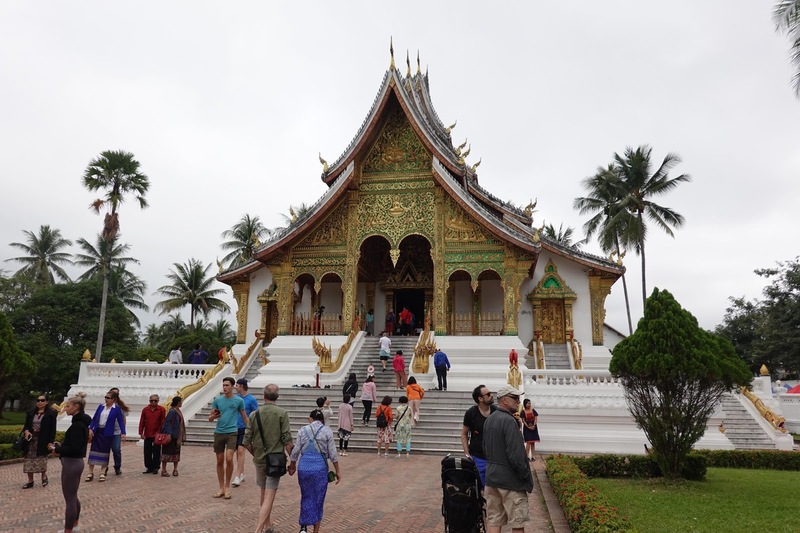 The Pagoda is inlaid with more than 5,000 solid silver tiles, each one-foot square! Imagine cleaning the tarnish off that! It is also full of gold pieces and a giant one-piece green “Emerald Buddha” studded with rubies and diamonds. Our guide told us it was a real emerald, but Wikipedia says it is probably green Baccarat crystal. Multiple cases around the perimeter house hundreds of gold and silver Buddhas given to the pagoda by individuals wanting to associate themselves with the giant Buddha and its blessings. All in all, I’m glad we persisted and finally visited the palace and by the fourth try we had actually learned enough to arrive early before the crowds. So as we exited, hordes of Chinese tourists led by bull-horn bellowing guides invaded the tranquility of the palace grounds making no pretence of the respect the guards had enforced upon us. Bare arms and legs were in blatant display. Our guide just shrugged. 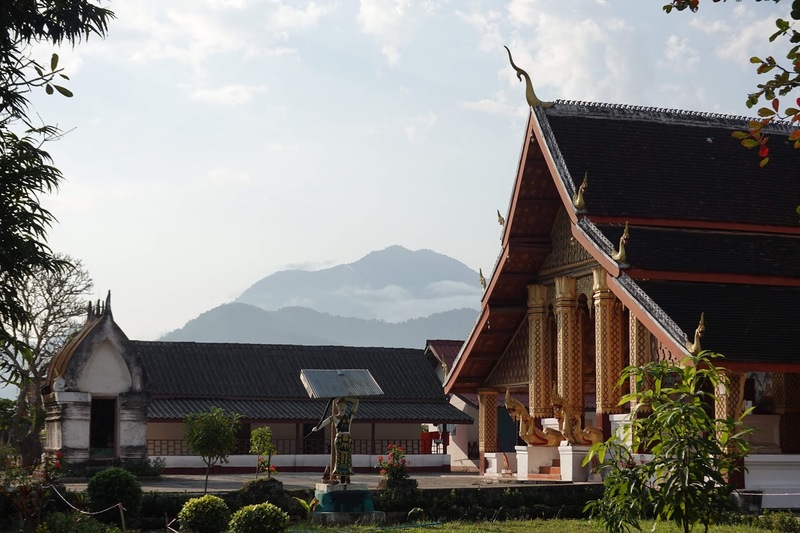 Luang Prabang is no longer the capital of Laos or a French colony but it’s still the spiritual capital of this tiny, poor country that only opened up to tourism in 1989. 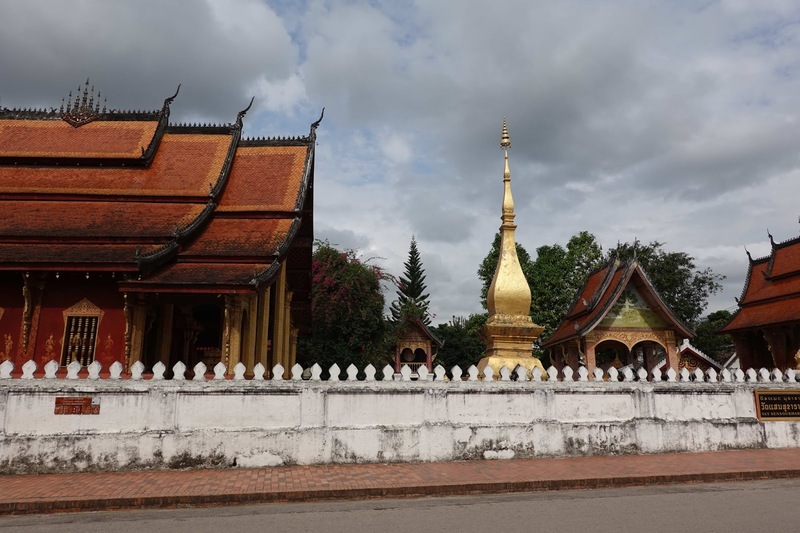 We came to Laos to bathe in the French Colonial atmosphere and to experience the mystical spirituality of the Buddhist temples that pervades this town. We wanted to live it before it becomes overrun with tourists and falls to the tidal wave of Chinese economic imperialism sweeping across Southeast Asia. The city was designated a UNESCO World Heritage Site in 1995 because of its well-preserved and beautiful French Colonial architecture and its 34 UNESCO-protected wats or temples, located within the small old town centre. 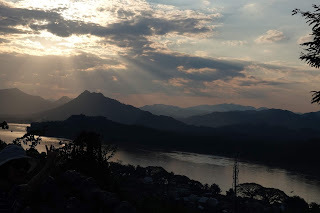 The town is trapped on a peninsula between two large rivers, the fabled Mekong on one side and the equally muddy-brown Nam Khan on the other. This prevents further expansion and may protect the heritage French-colonial buildings and the Buddhist temples. The peninsula is narrow enough at one end where most of the wats are located that we crossed it easily on foot in 10 minutes. 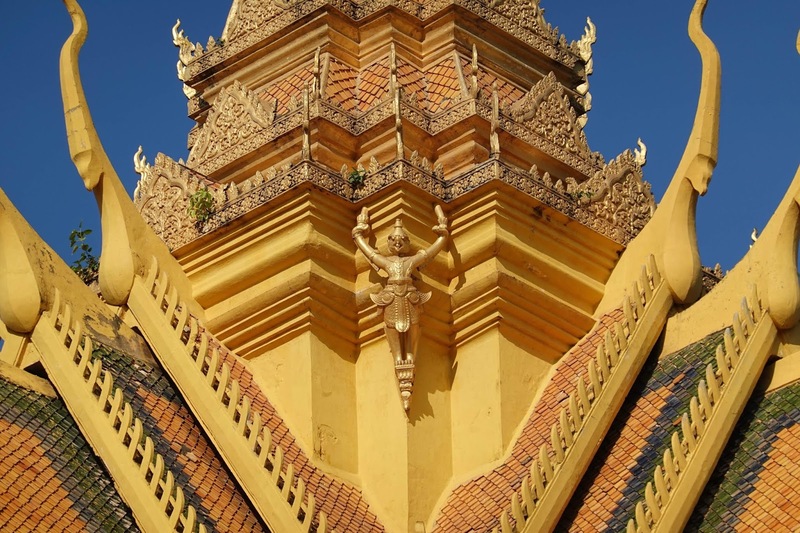 Nowhere else in Southeast Asia have I seen such a concentration of gold-clad temples. 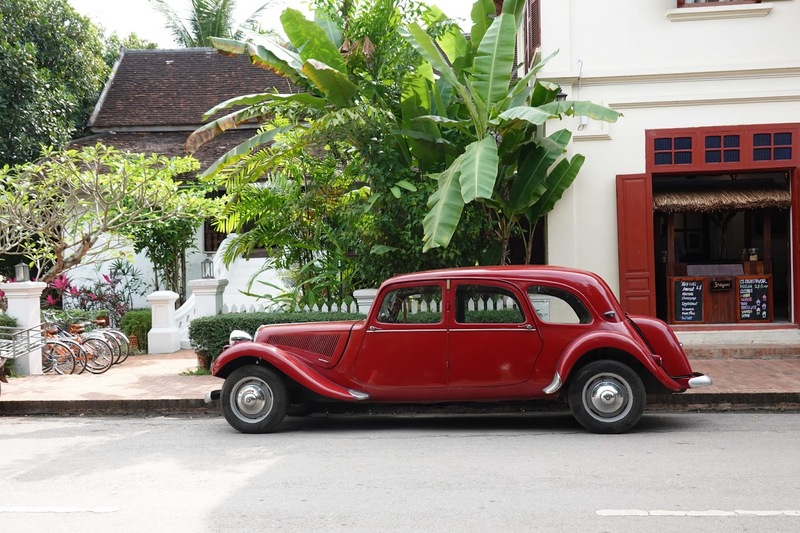 All are within easy walking distance on mostly safe and comfortable streets lined with French-style shops, cafes and restaurants many of which are housed in old French-style buildings. 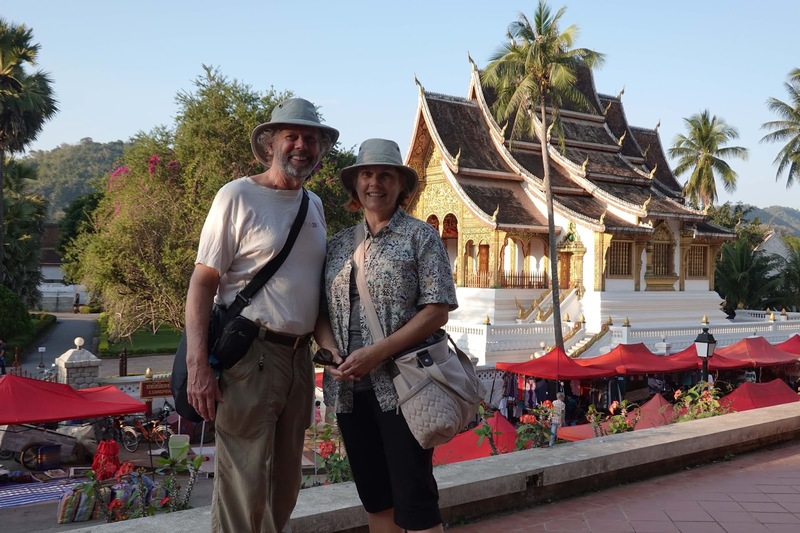 In fact, we made the rounds of the temples almost every morning passing through the day market, taking shortcuts down alleyways, and slowly checking out the coffee shops and the temples. 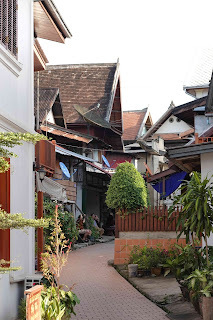 Walking from our hotel on the western outskirt of town took us 45 minutes, but it was a pleasant stroll that allowed us to walk off the calories from the French croissants at breakfast and the BeerLao at lunch. We often followed one river or the other because it was cooler. The 34 Buddhist wats are real working temples and schools, not relics or museums. 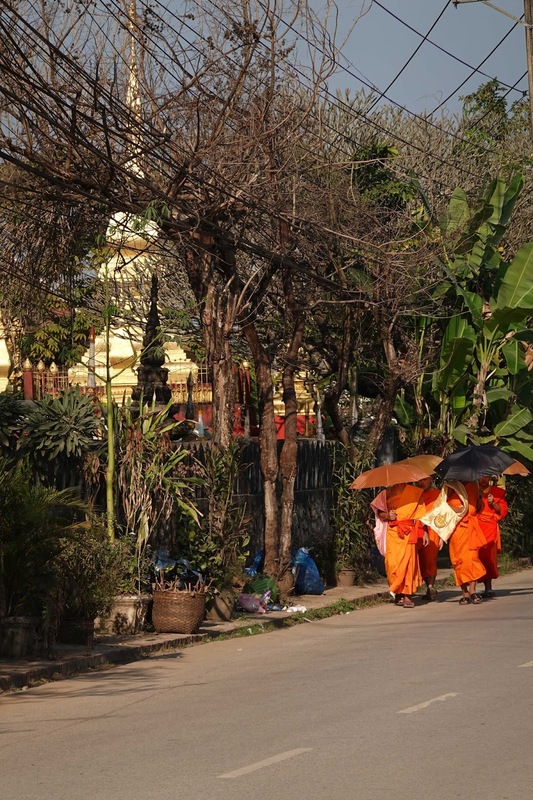 They are home to over 1,000 novices and monks continuing ancient Buddhist studies and education. This isn’t just a show for tourists. Monks teach young novices restoration techniques for their heritage. We met some of the former novices who came from poor rural villages throughout the north. They had gone to the wats for a free education and were now studying to be teachers at the university. Even though their English was poor, two were very eager to sit beside me on the boat taking us downriver in order to practice speaking to foreigners. We often found that the first question we were asked in restaurants or hotels was “Where are you from?”. It seemed to be a standard greeting that showed me that this town was still growing into its new role as a tourist mecca. In 1887 a mercenary army from China destroyed virtually all of the temples. Some were restored only recently with help from foreign governments including Italy. 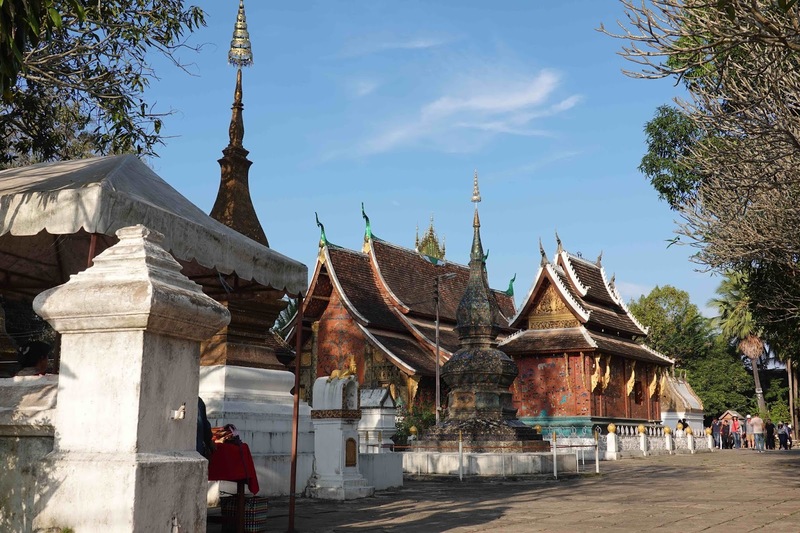 But they have been beautifully rebuilt or restored in a unique Laotian style combining traditional Buddhist and some French-colonial elements. Typically the Luang Prabang style temples have an elaborately painted red and gold front façade and sweeping roofs. 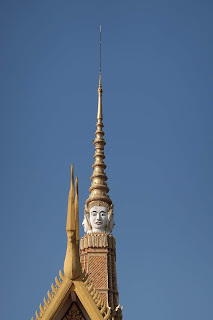 I know that in Thailand and Burma, the temples and Buddha statues are covered in real gold leaf. 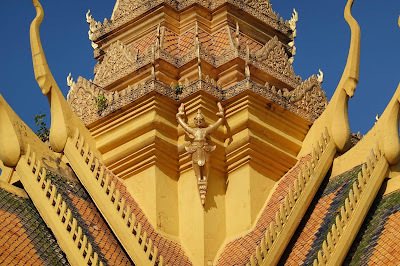 I’m not sure if that is the case here in Laos, but the gold is everywhere glistening in the sunlight. 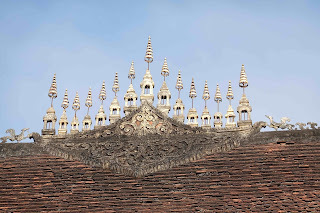 As you can see in the photos, the tips of the roof are adorned with finials shaped like a Naga, the mythological serpent believed to protect Buddhism. 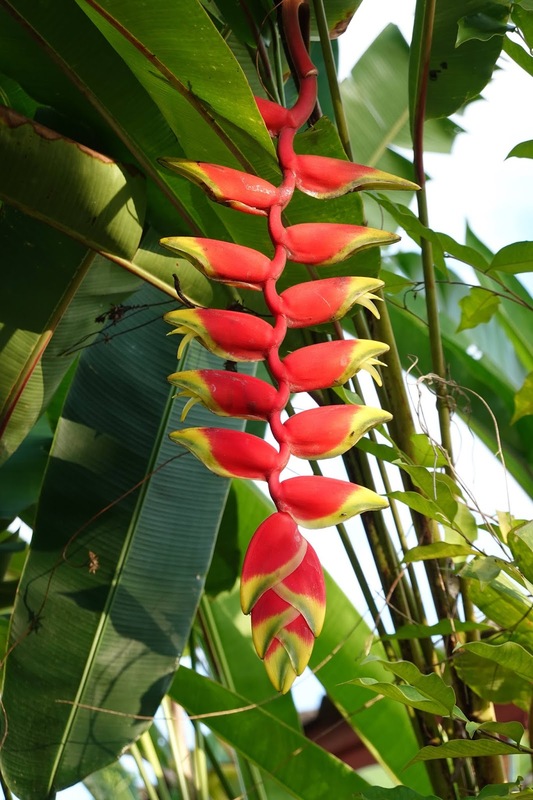 Some of these are gold, others are covered in emerald-green glass that sparkles in the sun. 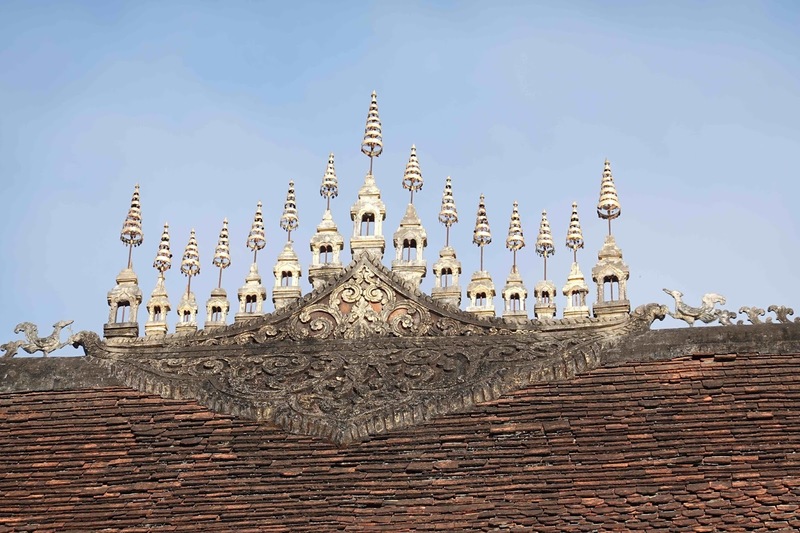 Another typical Laotian roof element is the miniature pagodas topped by multi-tiered parasols that you see on the peak of the roof. Perhaps because of the temples and its somewhat recent welcoming of tourists, Luang Prabang does feel trapped in time and more real than many other cities we have visited in Southeast Asia. But it is more expensive mainly because it is the premier tourist destination in Laos. It has become a bit “tony” as one American tourist observed to us, with more crowds and the modern invasion of busloads of Chinese tourists. 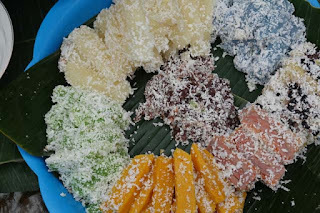 Nevertheless it is still fairly relaxed and hasn’t yet lost its authenticity and been completely overtaken by modernism and the chains of restaurants and hotels you find throughout Southeast Asia. It’s still clearly devoted to Buddhism and its past. 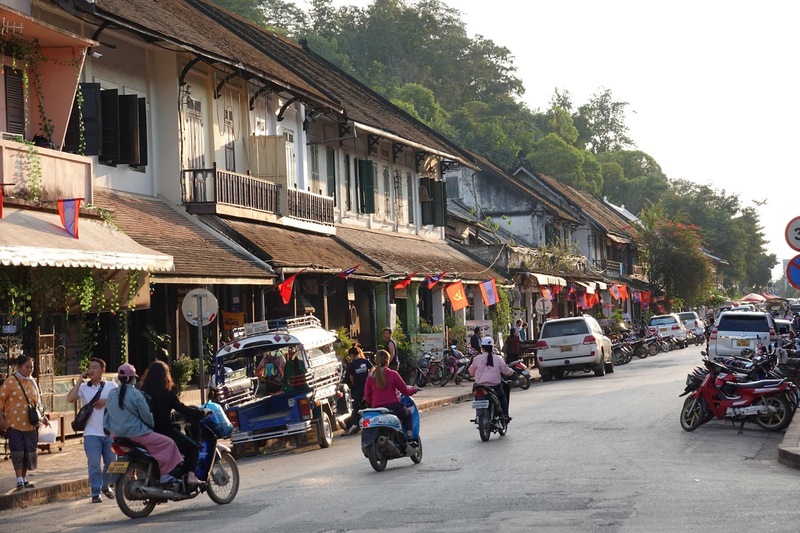 Somedays it seemed like the town was deserted, with only a few motorbikes slowly making their way up the main street. And on Sunday, we were amazed to see that almost everything but the street market had shut down. Often we were able to walk right down the main road. 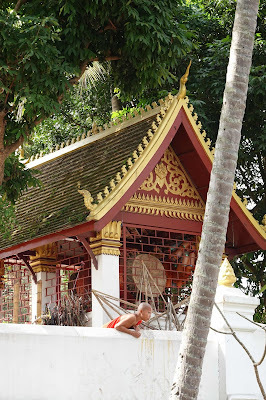 The peace and quiet were only broken by the occasional roar of a motorbike or tuk tuk gliding by. 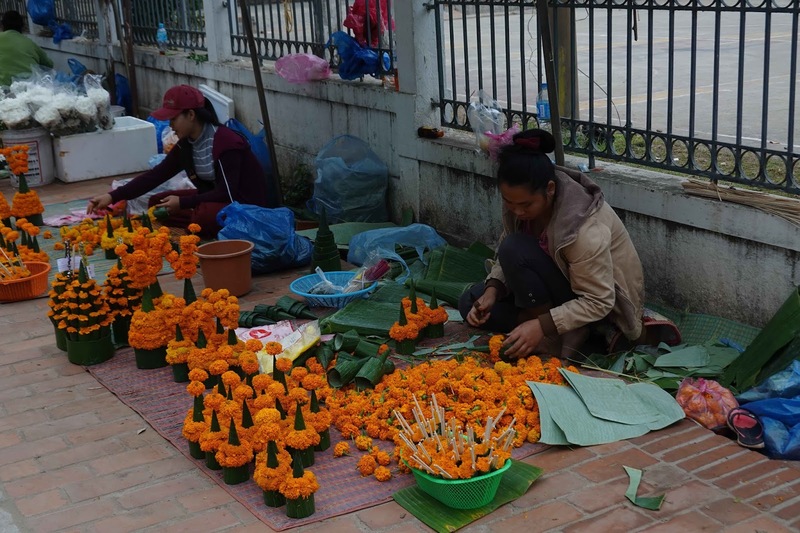 On Sunday, sidewalks were lined with vendors carefully pinning bright orange marigold flowers onto folded caps of banana leaves for offerings at the temples. People would leave these at a temple with some incense or place them in front of their business or home to receive blessings. In this tranquil, spiritual setting, we often sat in a quiet French cafe on the main street eating croissants, drinking tea or coffee, watching people and soaking in the ambiance. Elsewhere we actually saw locals casually playing petanque, a carryover from the French Colonial days, along with the croissants. But this sleepy atmosphere is quickly changing and this is one of the reasons we wanted to see Laos now before it is completely transformed by the hordes of tourism. 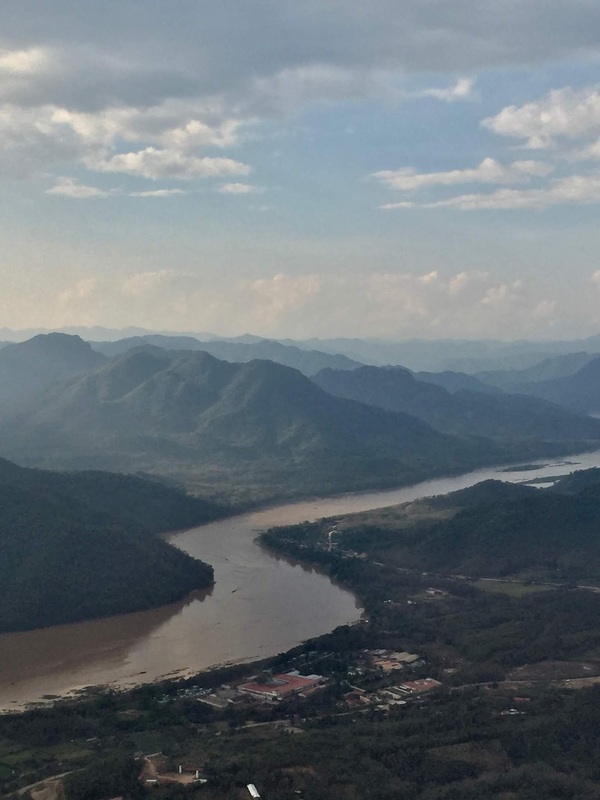 A new China-Laos high-speed railway is being built through northern Laos using Chinese workers to connect Southern China to the capital Vientiane, with a stop in Luang Prabang. This new modern “Silk Road” is planned to go all the way to Burma and Thailand in China’s new push for economic dominance in the region. We saw a lot of resentment about this in Cambodia, but there was no mention of it here in impoverished Laos. One sad consequence of this new popularity and the Chinese influence is that a lot of the products we saw for sale in the famous night market on the main street were from China, not handmade in Laos. But even though the gold and glitter of Luang Prabang may be tarnished, you can still feel the lazy, laissez-faire attitude of the French colonialists as you sit and sip your Laotian coffee with your croissant and watch the street slowly convert into the crowded red canopies of the night market. 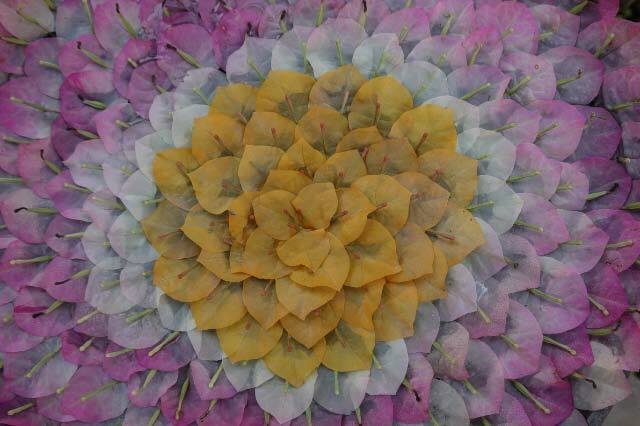 Steinbeck once wrote: "We do not take a trip; a trip takes us."